Rapeseed oil There is 1 product. Unrefined rapeseed oil is a rich source of antioxidants. Due to the high content of unsaturated fatty acids, it has a beneficial effect on the brain function. It prevents atherosclerosis and lowers the probability of heart attack. When used for joint inflammation, it effectively relieves the symptoms. It also regulates the digestive system. The high content of beta-carotene has a beneficial effect on eyesight and the immune system. 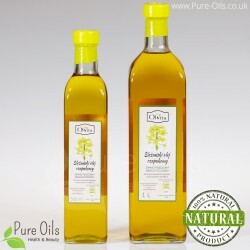 It is one of the most stable oils – resistant to high temperature and rancidity. Therefore, it can be added to all kind of dishes. It is often called ‘oil of the North’ on account of its similar composition to olive oil. However, rapeseed oil is better than olive oil as it contains greater amount of fatty acids omega-6 and omega-3 that are in a proportion ideal for the human organism 2:1. Only unrefined oil has beneficial effects on health. The process of refining deprives oil of its properties and is harmful for our organism. The best solution is to replace it with unrefined oil – the product, which will bring significant health benefits for our organisms.